HALLIE EPHRON: I once interviewed an author who had her husband lock her in the trunk of a car and drive around so she'd know what it felt like to be her character. Jeri Westerson goes to extremes like that for her art, too. Her latest, TROUBLED BONES, is just released from St. Martin’s Press. Welcome to Jungle Red, Jeri! 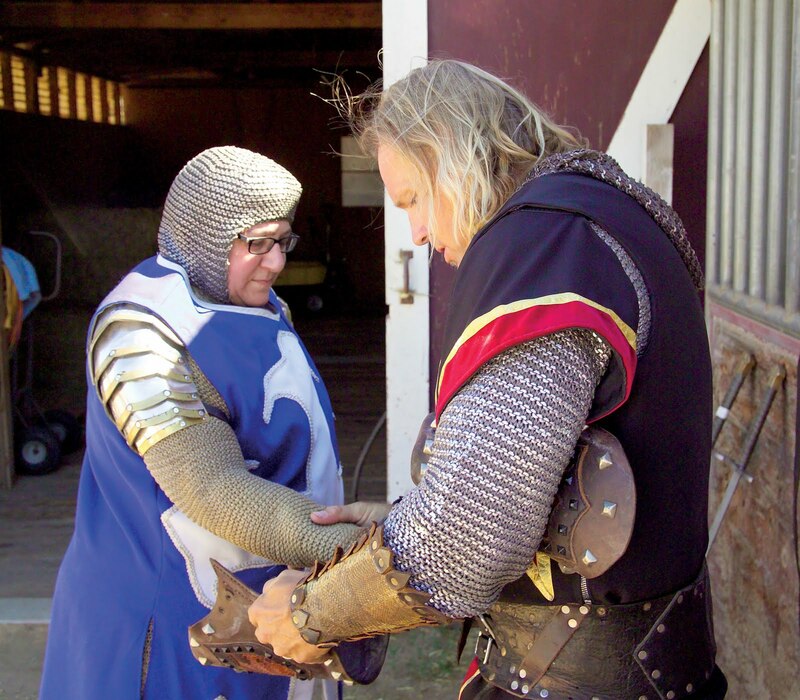 JERI WESTERSON: I spend a lot of time thinking about being a medieval knight. Which is, perhaps, an odd thing for a middle-aged, overweight, Jewish mother in southern California. I have a good excuse, though. I write about a medieval knight—an ex-knight, actually—Crispin Guest, who solves crimes on the mean streets of fourteenth century London in my Crispin Guest Medieval Noir series. He gets into all kinds of scrapes and has to take up arms at one time or another. Because of my immersion into the Middle Ages, one of my hobbies is collecting medieval weaponry and learning how to use them. After all, I can’t write about them with any sort of accuracy if I don’t know how to handle them. I like to do a lot of hands-on research for my novels, as a matter of fact. I sewed and have worn the right garments for the time period. I’ve made the food and even brewed the beer. But this city girl didn’t know squat about horses. What’s a girl to do? Why, find some knights, of course. 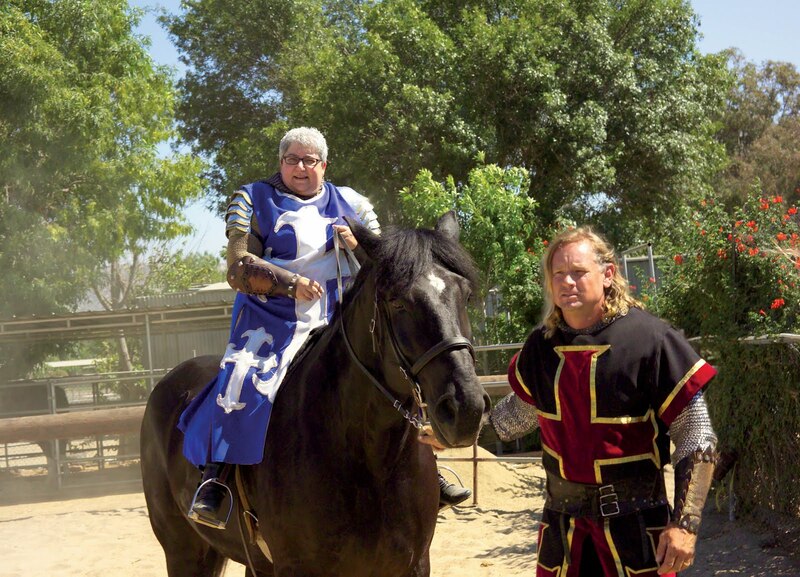 I met Thomas Montgomery at a local joust (yes, there are, occasionally, local jousts). I now feature him and one of his knights, Sir Anthony Parvino, every year at my book launches where they duel to the death with swords and otherwise offer verisimilitude to what might otherwise be a typical book signing. Montgomery, 40, has owned and operated the Imperial Knights for fifteen years, entertaining at corporate events, Renaissance Fairs, and local schools. 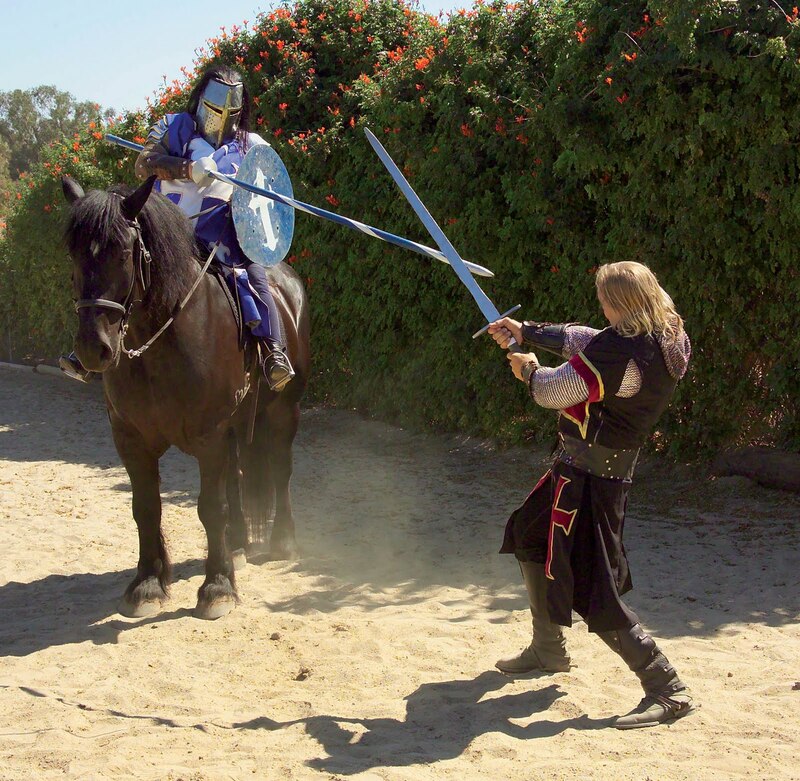 He got his start at Medieval Times Dinner Theatre and Tournament in Buena Park, California, learning the routines and much of his horsemanship there. He moved on to the Excalibur Hotel show in Las Vegas and even furthered his training to ride Lipizzan stallions. I’m not afraid of horses. Far from it. But I certainly wasn’t raised around them in downtown Los Angeles. My experience with horses consisted of the occasional pack train variety when I was a kid. And I usually got stuck behind the horse with excessive gas. Ah, those were the days. It was hot and dusty that June day when I went out to Montgomery’s ranch. He led me around to the back into the stables of his six horses. That’s where I met Thor, all two thousand pounds of black Percheron. Originally bred as warhorses, Percherons are used as draft horses these days. And he was a big fella, about sixteen hands tall. All Montgomery’s horses are gelded so, as he put it, they “wouldn’t get their own ideas.” Medieval warhorses were not. The knights believed it gave them the strength and courage needed to face an oncoming assault. And, of course, how manly would that be riding a gelding? Thor, a “big coach potato of a horse,” as Montgomery called him, would be my mount. That’s what I’m talkin’ about! But first, I needed to be armed. Around the Norman Conquest, knights wore mail shirts called hauberks that reached to their thighs, but for the era I write about, the fourteenth century, lots of plate armor was introduced. A knight in full harness could weigh anywhere from eighty to one hundred twenty pounds. One of the myths about armor was that it was too heavy to move in. A knight needed to be able to mount and dismount his horse, move easily, fight, even do cartwheels. About the only thing not recommended to do in one’s armor was swim in it! But I am not a trained knight. Far from it. A coach potato of an author myself, I was fully prepared to have a hard time of it. I was strapped pretty tightly into the mail. With the shoulder plates buckled on around my upper arms I felt sufficiently restricted in my arm movement. It would take a lot of training (and me many pounds lighter, I admit) to be able to fight let alone do cartwheels. Next my arms were secured with heavy leather vambraces—leather covers from forearm to wrist—and then I slipped on the surcote, sporting the knight’s colors. I moved stiffly through the barn to where Thor was fitted out and ready for me. But already I felt different. As an actor, a costume helps you get into character. Strapped into armor with wide metal shoulders, I started to get into the proper mindset to get medieval on someone. Thor stood ridiculously tall with his saddle and stirrups. He’d look more at home in front of a wagon loaded with beer barrels. But all I could think of in that moment was, “Thank goodness for the mounting stool!” I’m a bit on the short side, certainly shorter than even your average medieval man, and the prospect of mounting this draft horse was daunting enough. Up I went and, amazingly, I made it. I may be plump but I’m agile. After the stirrups were adjusted for my height, I got the feel of him. You are truly high up there and no doubt intimidating with some two thousand pounds of horse and battle gear bearing down on some hapless footsoldiers. They’d get out of your way, for sure. I wasn’t going to be doing any of that on Thor today, however. Just a little sauntering, but one can still get the idea being up so high and on so powerful a muscled beast as he was. After all, writing is not just about imagination, but absorbing experiences, whether emotional ones or ones with muscle and sensory memory. 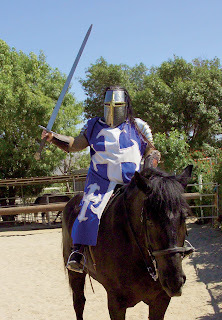 I was happy to have had at least a little hands-on experience on a warhorse and with a lance and armor. It brings my character Crispin Guest that much more alive. HALLIE: Yikes! You are a far hardier soul than I. Thanks, Jeri! This was so much fun! 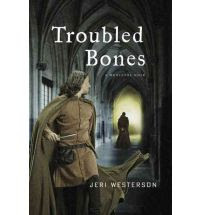 Jeri Westerson's latest Crispin Guest novel, TROUBLED BONES, is just released from St. Martin’s Press. Visit Jeri’s website to read excerpts at www.JeriWesterson.com. 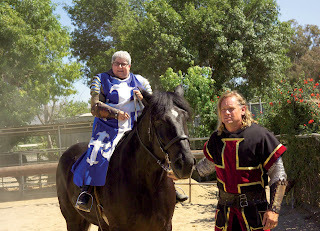 Learn more about the Imperial Knights at www.ImperialKnightsLive.com. Would someone please ask her about her collection of medieval weapons? Oh, your cleaning person must be ve-ry patient! SO do tell, Jeri! DO you have a special room full of...well, what exactly? And hey, where do you find this stuff anyway? congrats on the book--hope Crispin has many more adventures! I love these pictures! Jeri, I applaud you. This is going above and beyond for writerly authenticity. No wonder reading the Crispin books makes it seem as if I'm back in the 14th century. Jeri: You could possibly hear me chuckling all the way from Connecticut. This is great! I fear my stories of trying to get things right in Italy have no measure against yours. Wow. Talk about being dedicated to your craft! Awesome story, Jeri, especially with the pictures! Yes, tell us about your collection of weapons. What's the most gruesome one? Ah weapons. It's amazing what you can get on the internet. I have a helm similar to the one I'm wearing in the pictures, a pair of armor guantlets, a mail coif (goes over the head), a broadsword, a collection of daggers, a flail, a battleaxe, a spiked club, and a medieval arrow. When I go to libraries and other events, I do a demonstration, showing how they were used. Yes, there's nothing like watching an overweight middle-aged Jewish mother swinging a sword around. See some of them this Saturday at my book launch at Vroman's in Pasadena. I'm totally jealous. I went to a jousting match in Stockholm once and it never occurred to me that I could joust too. I can't think of anything more appealing than being immersed in the 14th century. I love the photos. Thank you for sharing them. I'm another one to say, "God Bless mounting blocks." 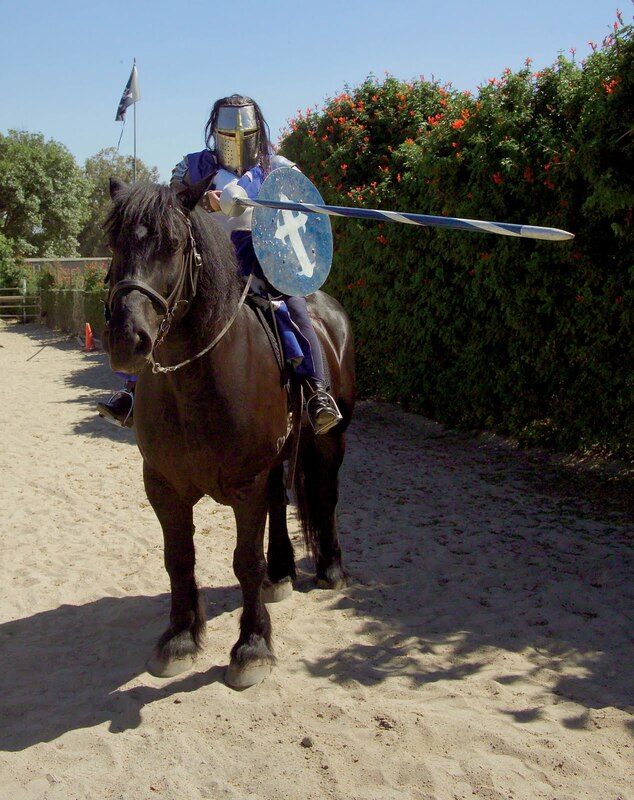 Especially when you have to climb aboard a Percheron - while you're wearing chain mail. Egads! Do you ever go to plays and see a fight scene and think, "That's not how you fight with a broadsword?" Rhonda, I think that all the time. Even in my favorite movie--the Adventures of Robin Hood with Errol Flynn--they do it so wrong. But hey, it's Errol Flynn so he can be forgiven. Jan, I would NEVER joust myself. That is way too scary. Those guys really get hit and like I said, it's a long way down. And in armor. I have seen real competition jousts and when those guys get knocked off their horses it is a big deal. No, I'll stay in the stands and cheer. You go girl! What work! What fun! Jeri, this was a wonderful post! I enjoyed it so much. My latest ebook is You & No Other, set in 1526, and I had an opportunity to edit the jousting scene before it was re-released. I would have loved to read your post then! Thanks for sharing this, and for turning me onto this great blog! Now I'm off to order a Crispin book. Jeri, you look incredibly nimble in those pictures. What is a flail? Sounds like a tool authors could use. I'm almost afraid to ask: What does he collect? Cool! Now I know the diff between a flail and a mace. :) Always thought they were the same. Thanks, Jeri. Hallie, the hubster is a commercial photographer, so he just collects old cameras. I also collect old typewriters. So we look mild-mannered on the outside. Wonderful! Thank you, Jeri, for sharing! LOL! Jerry. Loved the pictures. Now, if only I could experience demons and ghosts, characters in my paranormal romantic mystery, or maybe not as the case may be. Hope you had a good time! What a wonderful experience. I write in the Regency period and am so thankful to have had the opportunity to see the clothing and visit the houses and other things in that period. Wonderful post, Jeri! How thorough of you to actually don the gear and ride Thor. My in-person research seems very tame in comparison. I do agree that personal experience adds credibility to our writing.